THE VERDICT: Now this would have made for a stronger midseason comeback than last week’s underpowered effort. It starts well with a potently creepy opening in Saint Walker’s asylum, the gloom and the grime of this benighted place conjured with effective use of light and shadow and a tangible sense of decay. It’s beautifully lit, too, like a particularly depressing Vermeer.The moment a skull-masked Blood confronts his trembling, crucifix-clutching mother delivers a genuine old school jolt, not to mention a queasy touch of matricide. It’s soon apparent that this is an episode where the supporting cast have meatier material than the show’s hero. Roy deals with the implications of his Mirakuru injection – the show’s been edging towards the fantastic recently but his superstrength still feels slightly jarring in this Nolanised universe – while the writers continue to pump life into Laurel’s arc, a good job given she was in danger of becoming Arrow ’s most superfluous character. She’s certainly more intriguing as a broken figure, and her emotional confrontation with an unforgiving Lance is well-played. Glen Winter directs with style: there are some particularly slick transitions between the present and Flashback Island and the sequence where Oliver and Laurel escape from the archive is staged with flair. 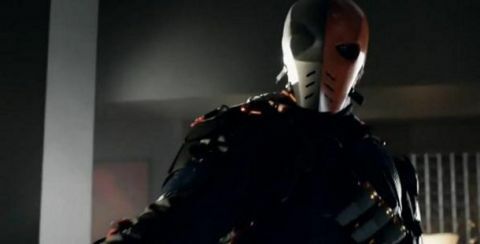 A word, too, for Manu Bennett as Slade Wilson, now shaping up as a properly heavyweight villain for Arrow , Darth Vadering Blood by the throat and commiting goonicide on his henchmen. Nice to see him in the full Deathstroke clobber, too – a strong visual. TRIVIA: Saint Walker’s hospital is named for Saint Walker, the founding member of the Blue Lantern Corps in the DC universe. A priest on the planet of Astonia, he’s the creation of Geoff Johns and first appeared in Green Lantern Vol 4 No 27. DID YOU SPOT? : Sebastian Blood mentions that he was raised in the Zandia Orphanage, a nod to his comic book origins in the fictitious nation of Zandia. DID YOU SPOT? 2: Laurel mentions Judge Carlin, an homage to Eisner Award-winning former DC Comics editor Mike Carlin. HMM: Oliver’s confrontation with a masked Blood is perilously close to a battle between Christian Bale impersonators. Strepsils, people!